Whether you’re looking for design pegs or vignette ideas, it’s safe to say that Instagram has got you covered. Just like a well of ideas, the social media platform allows us to view hundreds of accounts that somehow bring us around the world and inside other people’s homes for a dose of inspiration. 1. White furniture pieces and accessories go well with plants. Feel like you're in a tropical paradise or in your favorite getaway by treating huge potted plants as the stars in your living area. You can place these by the window, near your sofa for a truly relaxing feel. If you're working with a mix of big and small plants, the little ones can be displayed on the windowsill and the big ones in a corner. 2. Don't be afraid to mix-and-match your planters. While many prefer sleek white planters for their indoor garden, you can go a different route by experimenting with sturdy plastic ones that can hold enough soil. Planters in dark colors can stand out and add character to your space if you're following a light palette. 3. A big potted plant can serve as a statement piece. The Fiddle Leaf Fig has been a favorite by many homeowners and it's not surprising why. It has captivating lovely leaves and one plant is enough to spruce up a dull corner. As seen in Aubrey's home, you can repot the Fiddle Leaf Fig into a beautiful ceramic pot and place it in a corner of your living area, den, or lanai. Create a relaxing reading nook by placing an accent chair beside it. 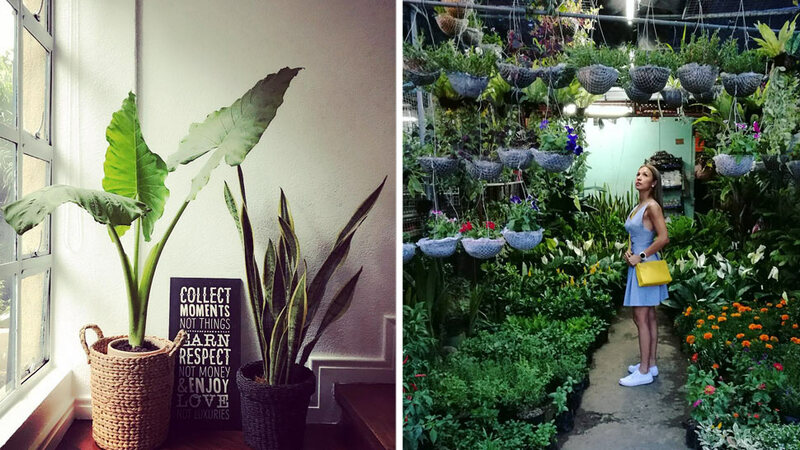 RL Tip: The Fiddle Leaf Fig is available at the Quezon Memorial Circle gardening stores. 4. Create an enchanting vignette using your chosen indoor plants. If you have a dull corner at home or an open space that's in need of sprucing up, a group of plants can help liven it up. Similar to what Aubrey did, you can display your plants on a table, then use an area rug to define the space. Those who are looking into showcasing succulents and cacti can work with a shelf, too. Complete your vignette by working with a variety of planters—bring in terracotta pots, woven baskets, vintage-inspired planters, and even colorful vessels. An eclectic mix of pieces can add personality to your setup. 5. Add life to your staircase with two or three plants. The foot of the stairs is an ideal spot for your plants. Take your cue from Aubrey's setup by creating a tropical-meets-rustic look. Use wicker baskets as your planters then place a wooden wall accent in the middle as extra decor. You don't need to drill holes—simply prop the accent piece against the wall and you're good to go. RL Tip: Find wicker baskets in different sizes at Dapitan Arcade. For pretty wall accents you can use, drop by any Papemelroti store. 6. Sometimes a single potted plant can work wonders, too. If you're not yet ready to maintain five or more plants at home, one huge pot can already make a difference. Make a statement and achieve a relaxing feel by repotting your Fiddle Leaf Fig into a pretty white textured planter. RL Tip: Find similar planters at The Landmark, Ayala Center, Makati City. 7. Turn your dining area into a resort-like space with huge indoor plants. Since the dining area is a special place where the whole family bonds, it's important to keep the vibe light, cozy, and inviting. Adding a large potted plant like Aubrey's Philodendron selloum in a corner can instantly transform the space into a paradise-like nook. You can also use succulents and herbs as part of your centerpiece. Cedarhills Garden Center, #57 Mother Ignacia St., Quezon City. Click here to follow them on Facebook. Angel's Blooms Garden, White Plains, Quezon City.